What is Saddle Stitch Printing? Home/Printing/What is Saddle Stitch Printing? What exactly is saddle stitch printing? What can this type of printing be used for? In this booklet printing guide, read on to learn all about saddle stitch. Although we live in a digital world, many businesses still have a need for printed materials. If your organisation needs booklet printing services, you’ll have to decide on a style. When it comes to binding, there are a number of options available. The style you go with depends on the type of material you’re having printed. One of the most common formats is saddle stitch printing. It provides a simple, yet professional booklet you can use for internal purposes or as part of your product. To help you decide if saddle stitch is right for you, let’s go over what exactly it is. There’s a good chance you’re wondering why it’s called saddle stitching. It’s definitely a strange name, but the explanation is pretty straightforward. This binding process utilises staples to join the pages of a booklet and the covers. The point where they’re connected form the spine of the booklet. During binding, the pages of the booklet along with the cover get folded. It’s then stapled along the crease of the fold from the outside. The staples clench on the inside of the centre pages. When done professionally, during the stapling process the pages get placed over a piece of equipment that resembles a saddle. In the printing industry, we refer to stapling as stitching. Hence the name. Typically only two staples are needed to hold the booklet together. However larger books may require more. This type of method is different from perfect binding, which uses glue to create a more distinct spine. Saddle stitch binding is much more appropriate for booklets with fewer pages. Let’s go over the types of printing this binding is perfect for. Saddle stitch binding is much better for shorter booklets. If you need something like a 200-page employee handbook, this method won’t work. The staples need to be able to penetrate all the pages in the booklet. Generally, between 60 and 70 pages are the maximum amount saddle stitching can accommodate. Alternatively, this binding can also create very small, four-page booklets. The covers generally use thicker, higher quality paper. This gives the booklet a more professional appearance. However, it’s not required. Businesses typically use saddle stitch binding to create product catalogues, brochures, and mailers. They’re also great for publishing small literary journals or magazines. As a general rule, you should opt for this type of binding method if you need a convenient booklet that doesn’t require too many pages. Saddle stitching is more affordable than other binding techniques, but you won’t sacrifice quality and durability. Booklets bound by saddle stitching come with a wide range of benefits. The most popular advantage is the cost. This binding is typically the most inexpensive option. If you’re on a strict budget, these booklets provide a quality product at a low cost. Saddle stitched booklets are easy to produce. The turn-around time is also quite low. This is the perfect option if you need materials produced for a last-minute meeting. There’s lots of flexibility with this type of binding. You can opt for pocket-sized booklets or larger books. You can also have holes included so the booklets fit into ringed binders. Saddle stitching is also perfect for short production runs. If you only need 150 booklets, this is easy to accommodate. Artwork such as graphs or product illustrations is easy to add. Your professional printer should be able to incorporate them with little effort. In saddle stitch booklets, the pages are in multiples of four. This means that each individual folded sheet will create four pages of the booklet. Because of this, the page count of a saddle stitched book must a multiple of four. If it’s not, you’ll have one empty page. There’s simply no way to get around this. By creating the layout properly in the beginning, you avoid running into problems down the road. You can opt to use software that will help you with the layout. However, turning the process over to a professional printing service may be easier. When it comes to the type of paper used, a thinner stock will allow for more pages. This is because the samples must be able to thoroughly penetrate each page and secure the booklet. If your booklet doesn’t contain many pages, you can opt for thicker, higher quality paper. This will give your booklet a more professional look and feel. Because the front and back cover will consist of only one sheet of folded paper, you can go with a different stock. You also have the freedom to add colour and graphics to the cover. If needed, the booklet will get trimmed around the edges to ensure each page is uniform. This helps achieve a professional appearance. It’s important to understand that with saddle stitch, there’s no room for text across the spine. In addition, if your booklet is too big, it may not lay flat. Keep this in mind if you plan to mail your booklet out. It’s also important to use margins so the text closer to the spine isn’t hard to read. You should also account for text close to the outer edge that could possibly get trimmed. Your printer can give you margin guidelines if you’re setting up the pages yourself. Regardless of the type of material you’re printing, saddle stitch binding is a great way to produce an affordable booklet with a professional look. This method is fast and allows for lots of freedom with regard to imagery and size. 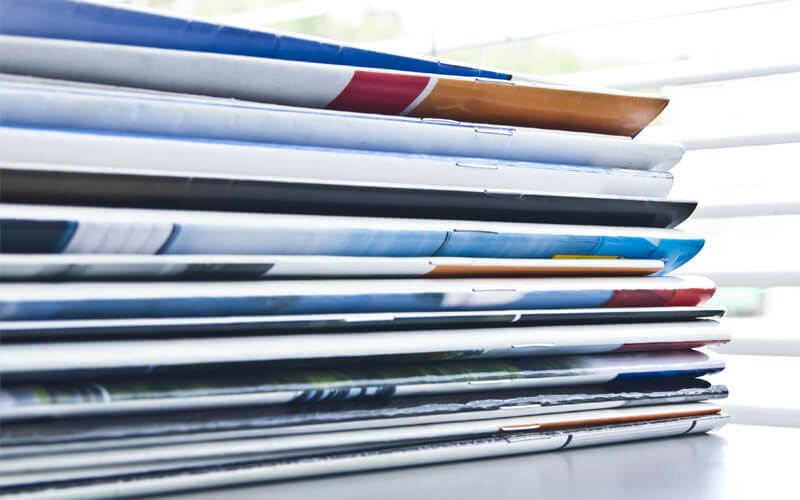 The next time your business needs brochures, catalogues, or any other booklet printing service, consider saddle stitch binding. We provide a wide range of printing and graphic design services for small businesses. Contact us today to learn more.